Ġgantija (Maltese pronunciation: [dʒɡanˈtiːja], "Giantess") is a megalithic temple complex from the Neolithic on the Mediterranean island of Gozo. The Ġgantija temples are the earliest of the Megalithic Temples of Malta. The Ġgantija temples are older than the pyramids of Egypt. Their makers erected the two Ġgantija temples during the Neolithic (c. 3600–2500 BC), which makes these temples more than 5500 years old and the world's second oldest existing manmade religious structures after Göbekli Tepe in present-day Turkey. Together with other similar structures, these have been designated a UNESCO World Heritage Site, the Megalithic Temples of Malta. The temples are elements of a ceremonial site in a fertility rite. Researchers have found that the numerous figurines and statues found on site are associated with that cult. According to local Gozitan folklore, a giantess who ate nothing but broad beans and honey bore a child from a man of the common people. With the child hanging from her shoulder, she built these temples and used them as places of worship. The Ġgantija temples stand at the end of the Xagħra plateau, facing toward the south-east. This megalithic monument encompasses two temples and an incomplete third, of which only the facade was partially built before being abandoned. Like Mnajdra South, it faces the equinox sunrise, built side by side and enclosed within a boundary wall. The southerly one is the larger and older one, dating back to approximately 3600 BC. It is also better preserved. The plan of the temple incorporates five large apses, with traces of the plaster that once covered the irregular wall still clinging between the blocks. The temples are built in the typical clover-leaf shape, with inner-facing blocks marking the shape. This was then filled in with rubble. A series of semi-circular apses is connected with a central passage. Archaeologists believe that the apses were originally covered by roofing. The effort is a remarkable feat when considering the monuments were constructed when the wheel had not yet been introduced and no metal tools were available to the Maltese Islanders. Small, spherical stones have been discovered. They were used as ball bearings for the vehicles that transported the enormous stone blocks used for the temples. The temple, like other megalithic sites in Malta, faces southeast. The southern temple rises to a height of 6 m (19.69 ft). At the entrance sits a large stone block with a recess, which led to the hypothesis that this was a ritual ablution station for purification before worshippers entered the complex. The five apses contain various altars. Researchers have found animal bones on the site that suggest the space was used for animal sacrifice. Residents and travelers knew about the existence of the temple for a long time. In the late 18th-century, before any excavations were carried out, Jean-Pierre Houël drew a plan based on that knowledge, which has been found to be highly accurate. 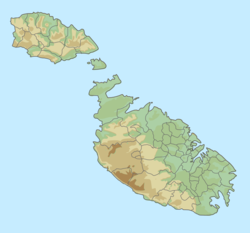 In 1827 Col. John Otto Bayer, the Lieutenant Governor of Gozo, had the site cleared of debris. The soil and remains were lost without having been properly examined. German artist Brochtorff had painted a picture of the site within a year or two prior to the removal of the debris, so he made a record of the site before clearance. After the excavations were conducted in 1827, the ruins fell into decay. The remains were included on the Antiquities List of 1925. The land was held privately until 1933, when the Government expropriated it for public benefit. The Museums Department conducted extensive archaeological work in 1933, 1936, 1949, 1956–57 and 1958–59. Its goal was to clear, preserve and research the ruins and their surroundings. The Ġgantija temples were listed as a UNESCO World Heritage Site in 1980. In 1992, the Committee decided to expand the listing to include five other megalithic temples located across the islands of Malta and Gozo. The Ġgantija listing was renamed "the Megalithic Temples of Malta"
The temple and the surrounding areas were restored or rehabilitated in the 2000s. Lightweight walkways were installed in the temple in 2011, to protect the floor. A heritage park was developed and opened in 2013. Stone spheres found at Ġgantija. Scholars suggest these were used to transport the enormous stone blocks for the temples. ^ "3600BC Ggantija Temples on Gozo – Millennium before the Pyramids or Stonehenge". Carnaval.com. Retrieved 25 September 2014. ^ "'Women in 18th Century Malta' to be launched at Ġgantija Temples". www.independent.com.mt. ^ Gunther, Michael D. "Prehistoric Temples Of Malta". Retrieved 19 September 2008. ^ "Protection of Antiquities Regulations 21st November, 1932 Government Notice 402 of 1932, as Amended by Government Notices 127 of 1935 and 338 of 1939". Malta Environment and Planning Authority. Archived from the original on 20 April 2016. ^ "World Heritage Centre – World Heritage List". Retrieved 19 September 2008. ^ Meilaq, Charles (7 November 2007). "Extensive works at Ggantija Temples". Times of Malta. Retrieved 25 September 2014. ^ "Enhanced visitor experience at Ggantija". Times of Malta. 23 September 2011. Retrieved 25 September 2014. ^ "Ġgantija Heritage Park project inaugurated". Times of Malta. 24 October 2013. Retrieved 25 September 2014. Wikimedia Commons has media related to Ġgantija.